Swami Vivekananda is the first and foremost among those great spiritual pioneers of the modern age who have sparked-off a new religious and spiritual awakening in India and the world. Vivekananda is held in great esteem among the community of spiritual seekers in India. Every seeker in India might have felt the positive impact of the inspired teachings of this dynamic and charismatic monk and Yogi. The major contribution of Vivekananda to Yoga is to reestablish this ancient discipline on a rational and scientific foundation by bringing forward the original principles of Yoga to the clear light of reason. “The teachers of the Science of Yoga” wrote Swami Vivekananda “therefore declare that religion is not only based on the experience of ancient times, but that no man can be religious until he has the same perception himself. Yoga is the science which teaches on how to get these perceptions—. The science of Raja-Yoga proposes to put before humanity a practical and scientifically worked out method of reaching this truth”. And in one of his talks Vivekananda said “out of bewildering Yogi-ism must come the most practical and scientific psychology” and considered this task as one of his “life’s work”. In his talks and books, especially his seminal works on the four major paths of Indian yoga—Yoga of works, knowledge and love and Pantajali’s Raja Yoga —Vivekananda had done his “life-work” with an exemplary creative force and inspiration. Vivekananda’s thoughts on religion and Yoga had a deep and lasting influence on many leading thinkers on modern psychology. For example, when he was in America, Vivekananda used to have long discussions with William James, who was regarded as the father of modern psychology. In one of his talks in Ramakrishna mutt in U.S., William James admitted that Vivekananda was a major influence on his thinking. Similarly Charles Tart another leading thinker belonging to the school of transpersonal psychology said in one of his books that in the writings of Swami Vivekananda he saw for the first time the most scientific and rational exposition of the religious and spiritual principles and practices and they were an important influence in shaping his thoughts. We don’t know the extent of Vivekananda’s impact on other leading figures in modern psychology like Carl Jung or Abraham Maslow. The other important contribution of Swami Vivekananda is the concept of Yoga as a science of accelerated evolution Swami Vivekananda is probably the first among modern exponents of Yoga to bring-out the evolutionary significance of Yoga as a science or the process for accelerating the psychological and spiritual development of the individual. This idea was later developed by Sri Aurobindo into an all-embracing and comprehensive vision of Yoga. But the seed idea of Sri Aurobindo’s vision of Yoga is already present in Swami Vivekananda’s teachings. In fact, Sri Aurobindo, in his seminal works on Yoga “Synthesis of Yoga”, paraphrases Vivekananda while talking about this concept of accelerated evolution. In the following passage, Vivekananda brings-out in simple words, without using the word Yoga, the evolutionary significance of Yoga. Even this hastening of the growth must be under laws. Suppose we can investigate these laws and understand their secrets and apply them to our own needs; it follows that we grow. We hasten our growth, we hasten our development, and we become perfect, even in this life. This is the higher part of our life, and the science of the study of mind and its powers has this perfection as its real end”. 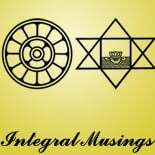 This entry was posted on September 1, 2014 by integralmusings in Religion, Spirituality & Philosophy.